We did a full size print on all sides. The graphic designer at Custom Earth Promos was awesome, she really helped me with the overall look of the reusable bag. I am very excited to receive our bags and hand them out to clients!! Great advertising method (recycled reusable bags). Our customers who support our store use this bag (RB19) everywhere. It also says a lot about the person and the company logo that's on the bag (that they care about the environment). 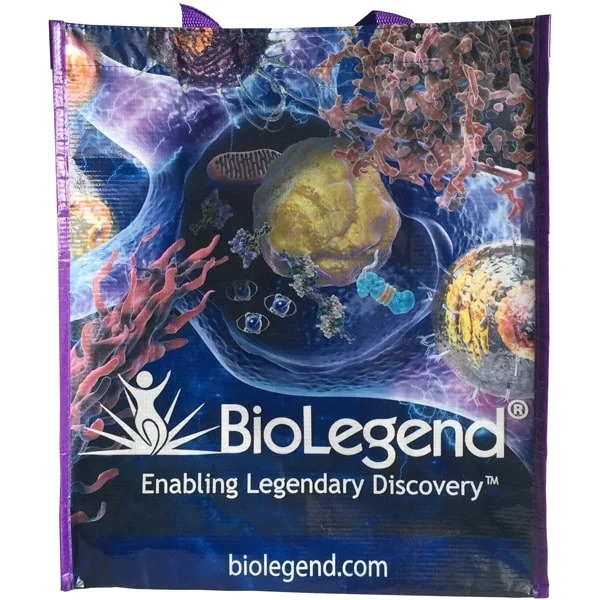 We handed this bag out as a promotional item at our latest trade show. All of the prospective customers and business competition at the show liked the bags and used them to stick everyone else's promotional items into. So our logo was visible all the time. I suggest to anyone who does trade shows to use custom earth promos for their reusable bags. I love that it is eco-friendly I just wish that I could have ordered a few less than the minimum requirement. We are coming out with more designs because our customers like the bags so much. Great high quality product and aggressive pricing. Great for food retailers, the bag is very easy to place goods into (it stands on its own). Very strong reusable bag, I would advise any food store to go with this model RB19. We use this model (RB19) at all my markets, the customers love it. Its very affordable at bulk orders. Love this bag. We reorder all the time. Just received our bags, they are the exact custom size that we specified. The print looks awesome as well. Long lasting material. The full sized graphic image still looks great one year later. I just placed a re-order for this bag. I work in retail and we use custom earth promos for our shopping bags. We charge a very small amount for the bags, women buy them all the time and use them for kids items, shopping at our store, the uses are endless. The great thing is that our company is playing a part in saving the environment (as well as getting repeated advertising every time a bag is used). I strongly encourage any retail store to use custom earth promos recycled reusable bags. My customers love that we are eco-friendly and use recycled reusable bags. Very cool bag, we use this company all the time. Best reusable bag we have purchased to date. I will only order this reusable bag for my stores. These bags absolutely stood out at my company's convention due to the full color imprint! Five stars for this bag!! 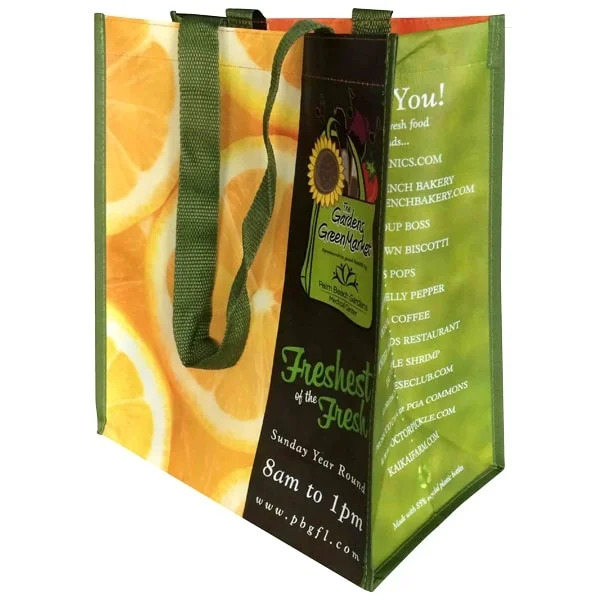 We received a great price for the large quantity we ordered and the full size printing on a eco-friendly bag was why we selected Custom Earth Promos. We were really able to customize these bags to perfectly fit our target audience. We added a velcro closure and out customers love it! I adore my bags! They withstand the toughest conditions and look amazing! The quality of our bags is amazing! The print is highly detailed and the overall quality is great! My bags are lovely. They are the perfect fit for my business considering they are laminated inside & out, making them extremely easy to clean. I highly recommend CEP & this bag! 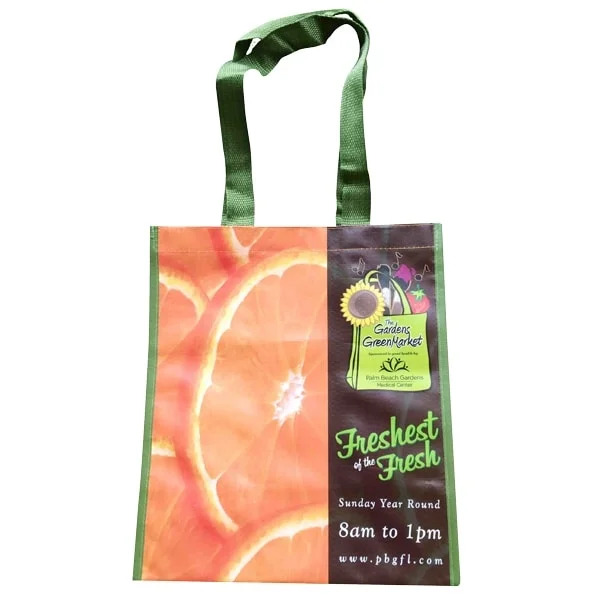 The unlimited imprint area available on these bags really maximizes our marketing efforts. The entire surface area of the bag is covered with our logo, making it impossible to miss. Amazing! The thickness and strength of this bag is just right and the nylon handles are able to hold the heavy weight my clients carry around on a daily basis. I highly recommend Custom Earth Promos. I have never had a bad experience with them, and this bag is by far my favorite. Very green company, just like mine. Eco-friendly is the only way to be. I suggest Custom Earth Promos to all. Absolutely stunning! My bags are highly detailed and look fantastic. They are able to withstand even the toughest of conditions as well. Thank you CEP! good product, good printed quality of our design. Very well priced wholesaler of recycled reusable bags. As well as other eco friendly products. These bags are the jam! I have never seen such amazing product the printing and stitching are truly professional. You would think this type of item would not be accessible to small businesses or local events but the pricing is remarkably within our budget. I am so proud to see my design around town on these grocery totes. 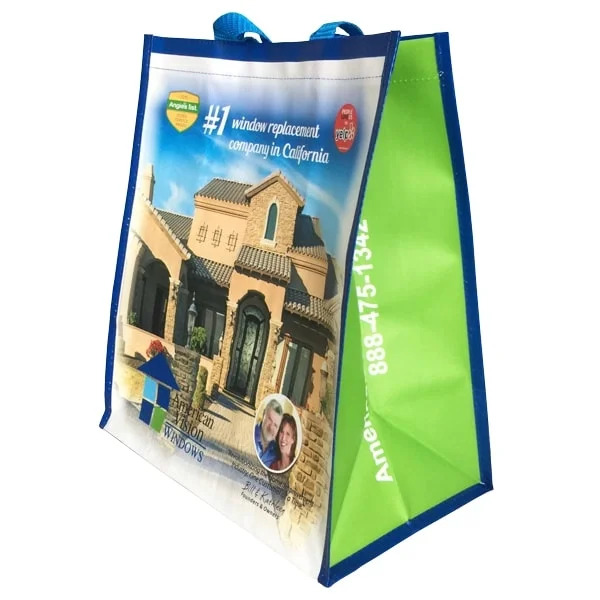 I highly encourage all of the companies that use our marketing services to use recycled reusable bags for as a promotional item for there companies. It tells consumers you care about the earth where we live and your brand will look great and get promotion wherever the customer takes the bag. We have used a ton of promotional companies, we only use custom earth promos now for there customer service and reliable quality products. Should have ordered these a long time ago. Excellent reusable bag and asset to our store. 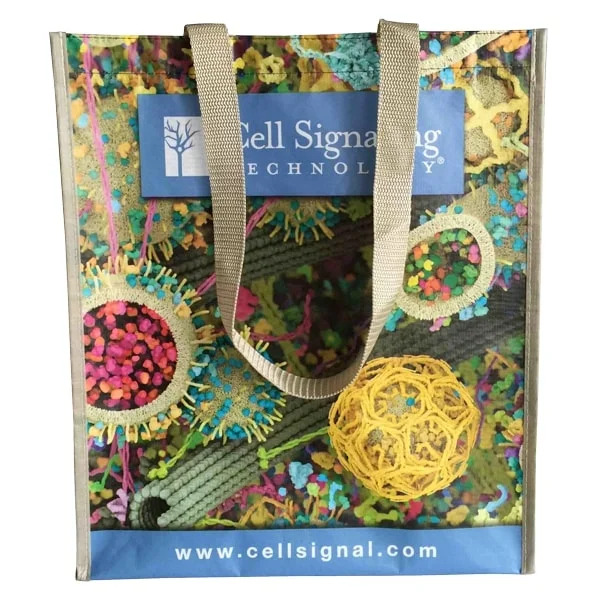 Our Custom Reusable Shopping Bags are always environmentally conscious and built to withstand the toughest conditions and treatment. It starts with sorted, cleaned and recycled water bottles (RPET) that otherwise would have been sitting in a landfill. We skillfully transform this useful, durable material into the beautifully decorated reusable bags that you’ll eventually be using to promote your brand. RPET is both food-safe and BPA-free, so you can rest assured that your groceries will be protected. 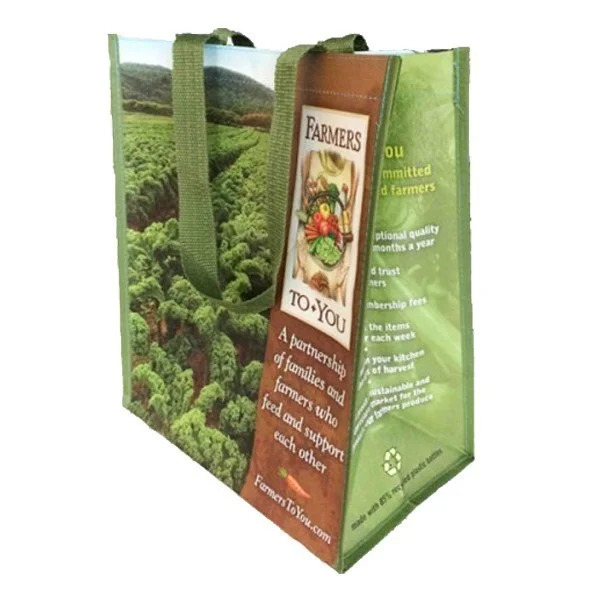 Perhaps the most useful feature of Custom Earth Promos' Custom Reusable Shopping Bags is its exterior/interior lamination. 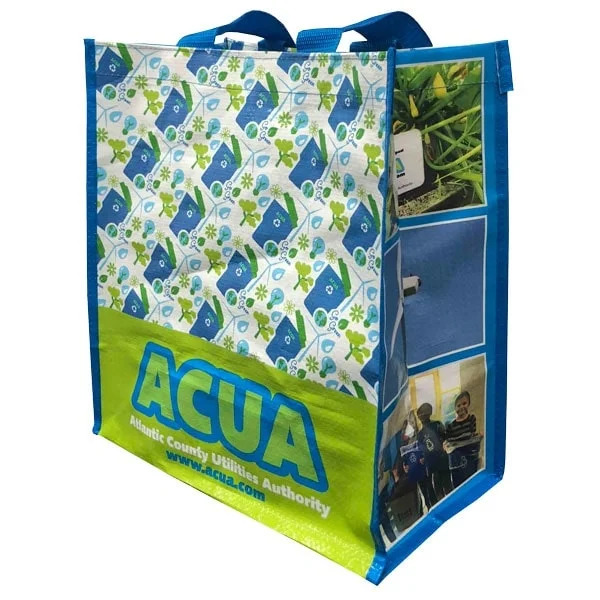 Other soft grocery bags absorb moisture, but because these eco-friendly totes are laminated on either side, they actually repel water on both the inside and outside surfaces. This feature can save you a lot of mess, and a simple sponge wipe will clean things easily if you do spill. Plus, the design options are almost endless. 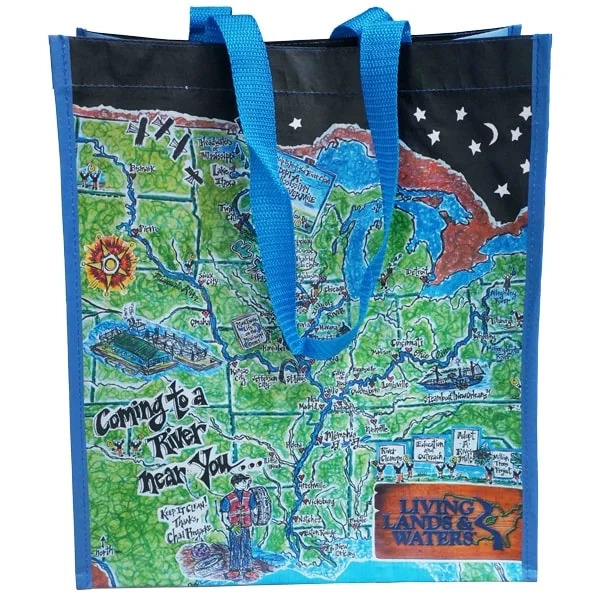 Just let your imagination run wild as we help you customize the perfect look for your custom grocery totes. 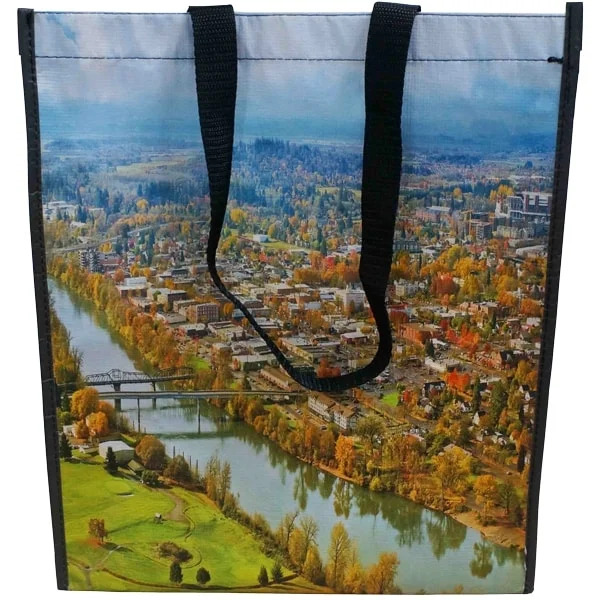 Our factories print with precision, and the smooth finish of these Custom Reusable Shopping Bags make the perfect surface for detailed artwork. 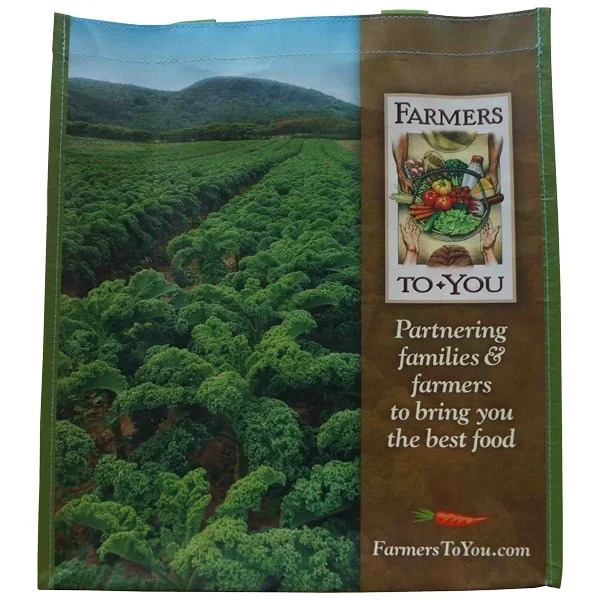 Designed with the farmer in mind, our Custom Reusable Shopping Bags are used to transport fresh produce, dairy and other farm-raised goods from local farms to local neighborhoods. Why send a mixed message to customers by delivering sustainable and eco-conscious foods in disposable, environmentally toxic plastic bags? Custom Earth Promos RPET bags are food-safe, reusable and recyclable. This fashionable, earth-friendly tote is always the perfect way to deliver your product. Farmers prefer our reusable bags because their extra sturdiness is perfect for repeated use in any environmental conditions—rain or shine. The durability of our Custom Reusable Shopping Bags is the result of our manufacturing process, which combines strands of recycled material, weaving them to create a novel recycled woven PET material. During this process, we make our bags glossy and smooth on both the inside and outside, so you get a beautiful, practical reusable tote you can rely on every time you use it. What makes Custom Earth Promos' bag-making process truly remarkable is our attention to detail. And that’s a characteristic you won't find with your average promotional product company. Before we ever print your custom grocery totes, we take the time to ensure that your artwork looks exactly the way you want it. When you choose our custom bags, you’re showing your farmer's market and all the rest of your customers that you're making a serious effort to support the environment. Watch as people applaud your eco-friendly mindset and ask you how they can join your cause. 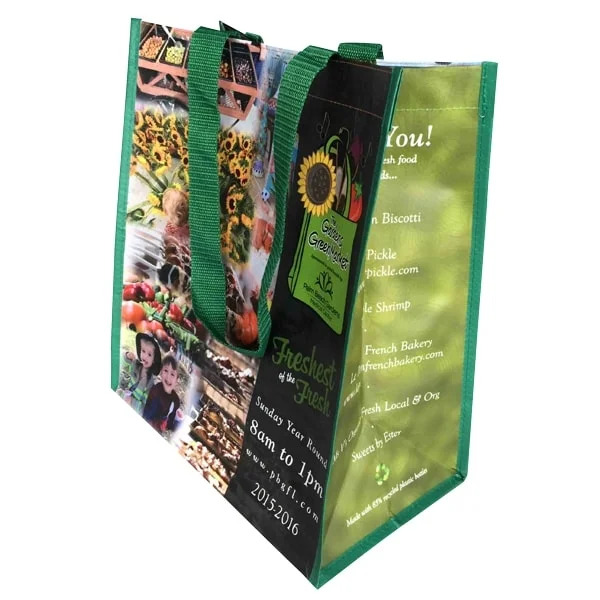 And with our factory direct import process, we can completely tailor our Custom Reusable Shopping Bags to your exact specifications, so your recycled bags are designed to attract attention and meet all of your marketing needs.